Making soup is like playing matchmaker. You try to pair ingredients into a lively but sustainable relationship. Sometimes things go together. Sometimes they don’t. Sometimes opposites attract. Sometimes like attracts like. There isn’t a consistent formula. Not that I’m an expert, I’m a guy. Even worse, I’m a husband. All I know about relationships is that successful ones need a lot of work. But they all begin the same way. The partners start out with stars in their eyes, thrilled by the newness of the mixture, whispering about forever and how they complete each other. (Ugh!) After a while the novelty grows thin and they fall back on familiar roles. One personality starts to dominate. The other feels underappreciated. It leaves a bad taste in your mouth. At this point the less experienced cook gives up and moves onto something new. The rest of us get to work (therapy). That’s what happened with my borscht this time. I remembered it as the most beautiful soup I had ever made. 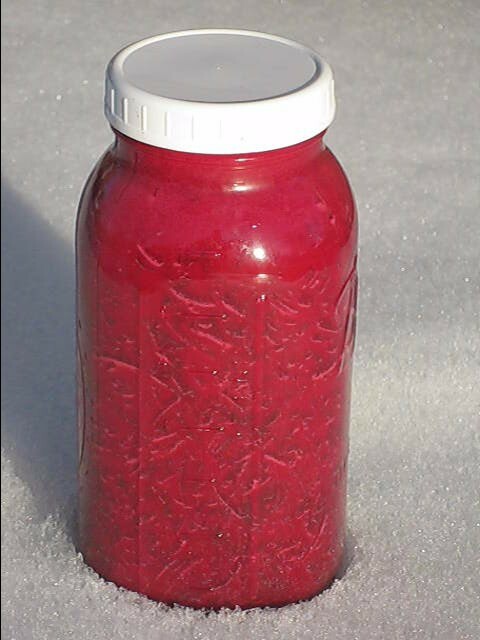 The purple of the shredded beets spanned the pale pink of the liquid like the layers of a sunset. I remembered the balance of flavors—the sweetness of the root vegetables complemented by the richly flavored broth. What I didn’t remember was how the pieces all fit together. My latest rendezvous with this soup started at Caputo’s, a great produce market here in Chicago’s western suburbs. They had loose beets you could buy in bulk, fresh dill that wasn’t in a ½ ounce plastic container, and an assortment of vegetables that made me think I was back in California …almost. I hurried home, peeled the beets, tossed them in the cuisinart, combined them with the stock and dill in a covered pot and put the soup on to simmer. A couple of hours later, I finished it with sour cream, put a spoonful in my mouth and… cringed. It wasn’t bad. It just wasn’t what I had in mind. The broth was full and sweet but the first bite of beets shouted the other tastes into submission. My ingredients were arguing with each other. No problem. Relationships don’t always run smoothly. Sometimes they need a little assist. To mellow the flavor of the beets, I added red cabbage. A good start, but it didn’t go far enough. I added more dill, more sour cream, but the soup still wasn’t where I wanted it to be. The beets were just too overpowering. I needed an ingredient that could stand up to them and restore some peace to my stock pot. Sure enough, a few cloves minced into the borscht brought out the harmony I had been looking for. Sadly, the beets may have had their feelings bruised a bit and, well, I’m sorry for that. Whoever said love meant never having to say you’re sorry was just plain wrong. Love means saying you’re sorry a lot—early and often. How else do you get to the second honeymoon/course? Note: We have made Holiday soups every year since the late ‘90s, but it wasn’t until my wife’s cousin requested Borscht that I discovered this fabulous soup. Thanks Aaron. Put the beets, cabbage, garlic, dill, stock and seasonings into a 3-quart pot, bring to a boil, then reduce it to a simmer and continue simmering for about an hour. Remove from heat and finish by stirring in sour cream. Serve warm, but not hot, with fresh crusty bread and butter. Eat it again the next day. It tastes even better. Photo Credit: Yours truly. The picture doesn’t do the soup justice, but we’ll always have Paris. Comments? Questions? Requests? Why? This is a work in progress. Aren’t we all? I’ll be listening and responding. Please be courteous. I made the Cucumber Soup today and it was almost as good as the one you made. I’ve got the ingredients for the Carrot-Fennel and the ‘Carne Asada’ (mushroom) Soup so I’m on the way to being Soupy Mom. I loved the photo for the Borscht…it looked so pristine. I’m glad the cucumber worked out. Let me know how the other ones work out too. I think it’s time to start jarring the soups I make. Don’t know if the family can tolerate eating all of these soups every week. If the immediate family can’t take it, the extended family will help out!!! Great. I need all the help I can get. Thanks for the nice words, Leslie, and thanks for reading. you rite gud! didn u an me go to usee es bee? As I live and breathe. Hope things are going well out in “sunny” CA. Had any good venison lately? no venison but some edible firehouse turkey meatloaf (meatloaf,schmeatloaf, double beatloaf.i hate meatloaf) with glazed yams and baked beans- good on those brisk L.A. nights. (you heard right- we are southlanders now) be well. The greatest thing about being an LA area fireman is it’s chili season all year round. Send me your recipe. I’ll send you mine (it’s veg. and it’s good). I remember getting your borscht one Christmas. It was delicious. I’ve been waiting to be able to make it myself… Thank you. First, though, I’m going to try the Carne Asada. I’m going to make a little change, though, and try it with seiten instead of the portabello mushrooms. If it works, I’ll let you know. (If it doesn’t work, I’ll let you know, too, but I probably won’t be as enthusiastic…) Love to you! Glad I could be a part of your inspiring work. Borscht is still my fav. When you come to NYC I’m taking you out to Brighton Beach, Brooklyn, where the Ukrainians let it all hang out. You’re gonna love it. Be careful what invitations you make. Chicago is a lot closer than LA. I would love to try the real thing.